AquaBliss has unveiled its latest high pressure shower product, the TurboSpa. The shower offers consumers a fantastic home spa experience, with zero maintenance, a quick and simple installation and 30 day money back guarantee. AquaBliss, the family-owned company committed to bringing clean, pure water to homes across America, has announced the arrival of a revolutionary new product: the TurboSpa. TurboSpa offers the ultimate spa experience for customers to enjoy within their own homes, thanks to an ultra high pressure shower head which will see any stress melt away into bliss within moments. The TurboSpa shower has the flexibility to impress even the most discerning of consumers, with an adjustable 42-nozzle wide spray shower head that’ll drench and massage every inch of the body. There’ll be no dry spots; that’s a guarantee. TurboSpa’s revolutionary technology forces water out faster than a traditional rain shower head, channeling water just like a rock wall at an exotic tropical waterfall. A pivoting wide spray head and tank-tough brass ball joint combine to enable consumers to direct every single one of the TurboSpa’s 42 water points into a single high flow shower pattern. A unique flow restrictor setup and cutting-edge independent channel design delivers the fullest water pressure allowed by US Government regulations, so you can bet you’ll be getting the finest spa experience at home. With a simple, three-step, no-tool installation, the TurboSpa is quick and easy to fit. TurboSpa’s universal compatibility guarantees a leak-proof fit with any standard, threaded fixed shower heads. 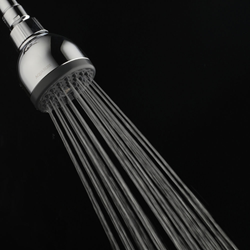 All you need to do is twist off your current shower head and replace it, by twisting on your new AquaBliss TurboSpa. You’ll be in a high pressure shower nirvana within moments. The AquaBliss TurboSpa comes complete with a one year warranty and VIP USA support. The shower benefits from a crack-proof pivot point as well as self-cleaning nozzles, so there’s no maintenance involved. So, if customers don’t feel that their showering experience has been utterly transformed, they’ll be able to request a full refund - no questions asked. To find out more about AquaBliss and their product range, visit http://www.AquaBliss.com or like the AquaBliss page on Facebook to join the growing community of shower enthusiasts that receive exclusive bathroom information and tips.